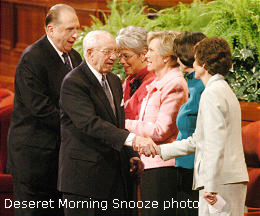 Add your own captions to The First Presidency - Relief Society Mixer Scene. Checkout your competition below. Hinckley: It's a real pain to have to deal with our second-class members. Hinckley: I have had a revelation that you are to be my new wife. Sister in off white suit: Didn't you just say that to the other girls? Hinckley: Um...now what do I say Tommy? Lady in light-pink jacket speaking to Monson: "Brother Monson, is that a Book of Mormon in your pocket, or are you happy to see me?" Lady in dark-pink jacket glances down at Monson's pocket. Brother Monson's reply: "Oh, it's a Book of Mormon."